My Family and I adopted a dog of yours about 4 years ago. We adopted a German/Australian Shepard mix. Her name was originally Legs. She was abused and beaten. And had 4 homes in the time period of 11 months old. The Foster Home renamed her Bella. Which we thought was very pretty. We had a lot of worrying at first. She wouldn’t eat, nor drink. But we knew how scary it would be to go to a new place. We gave her time and of course love. But over the years, I think we renewed her. She is still afraid of big things and shadows. But it is a lot better. She even knows how to sit, lay down, shake hands, speak, and my favorite, High five. 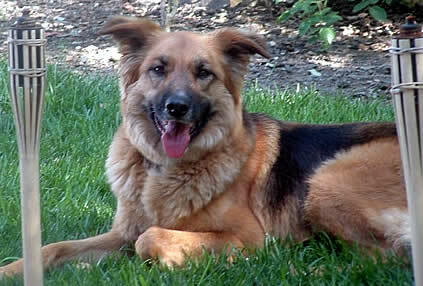 But Bella has given me a valuable lesson and when I grow up and get my own house and a family, I know that I am going to get a german Shepherd from GSROC. Most definetley. I have attached a picture of Bella. She is now 5 years old. And a very happy dog.